Cool weather is on its way. Apple-picking, gorgeous landscapes with abundance of colors, the mountain hiking and camping! Fall is my favorite season. Unfortunately, Fall has a side effect: dry and itchy skin. I developed a body butter recipe that is super moisturing and pampering to the skin and a little goes a loooong way. Apply the butter when the skin is still damp to seal in the moisture. You can purchase a sample size (about .30 oz) at my etsy shop at: http://www.etsy.com/shop/puressential. I have included my recipe for you. Here is the recipe. 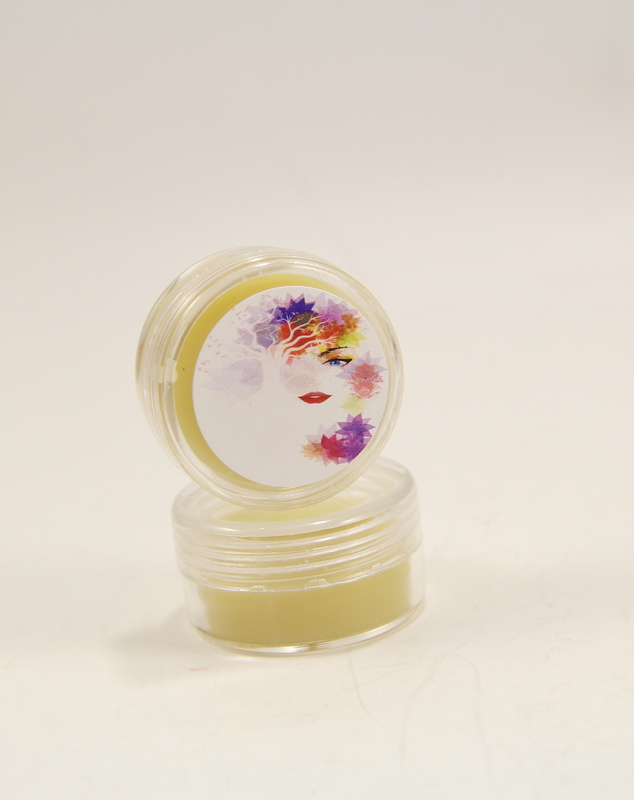 It contains all natural ingredients and it is easy to replicate at home.Make sure all ingredients are raw and unprocessed to reap the skin nourishing benefits these ingredients have to offer and the essential oils used are pure and unadulterated to avoid possible toxicity and sensitization. Melt all the above ingredients on the stove. 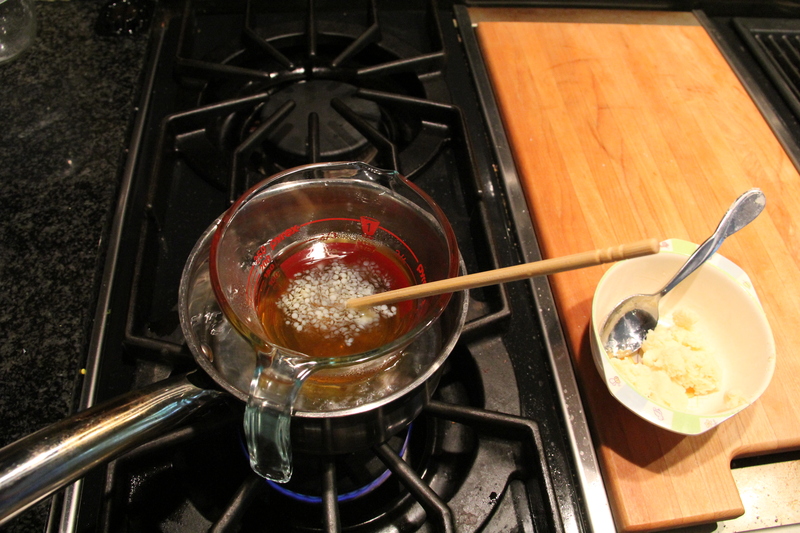 I used a glass pyrex in shimmering hot water so not to scorch the wax and butter and oil. 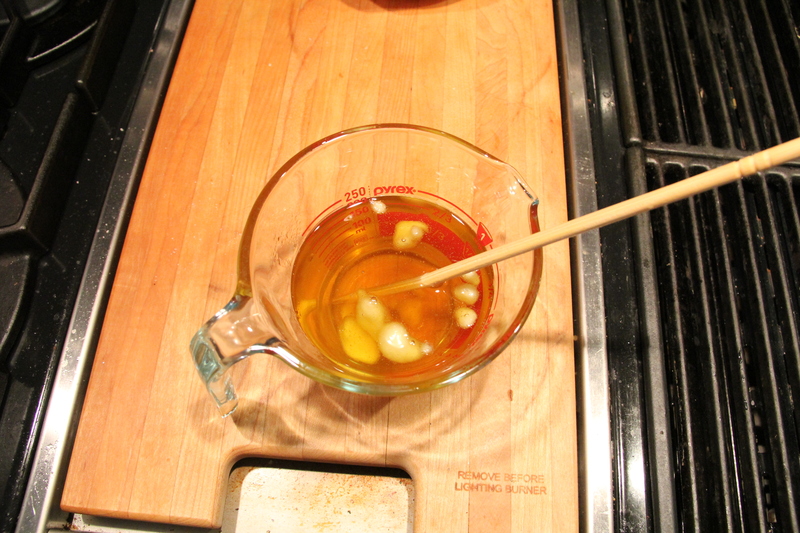 Once all is melt, remove the pyrex and add the shea butter the last. Shea butter will get gritty if melt at high temperature. And into this luscious mixture, I added 20 drops of 3 types of lavender (wild, highland and French), 20 drops of chamomile (Roman, German and Cape), 20 drops of Geranium, 15 drops of Palma Rosa and 10 drops of Myrrh. Total: 85 drops. The ratio is about 10-12 drops of essential oils per ounce of the base. You can easily make less or more based on this ratio. If you are making it for your children, cut the essential oils to half, about 5-6 drops per ounce. I have 2 swimmers who swim year round. This butter works wonder for their dry skin especially in winter time. Lavender and Chamomile are skin healing and calming to the central nervous system, Palmarosa stimulates cell regeneration (an excellent oil for dry skin, eczema, psoriasis), Geranium is my favorite oil and is skin healing and has a stimulating effect on lymphatic system. The lymphatic system tends to get stagnant during winter months due to the cold environment and lack of exercise for some people. 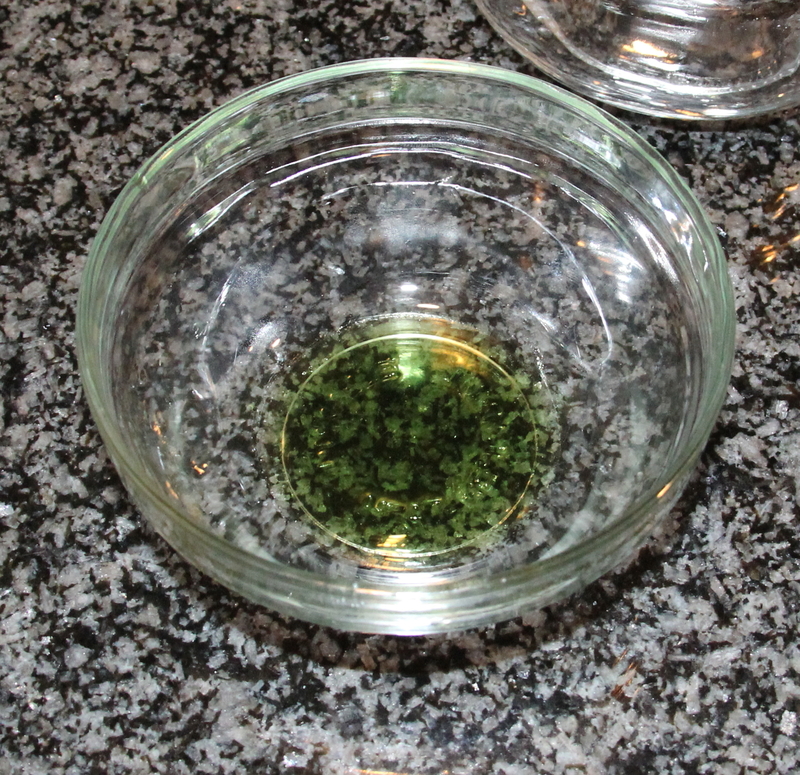 The color turned out to be a beautiful emerald green mainly due to chamomile and myrrh. The aroma is floral and pleasant.